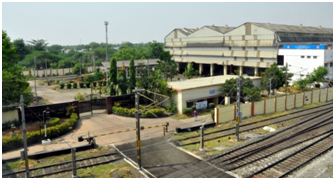 Electric Loco Shed is homing the work horse (WAG-7) of Indian Railways in Secunderabad division of South Central Railways is located in “Kazipet”, Warangal District – Telangana State. The Electric Loco Shed was inaugurated on November 2004 to cater the needs of freight traffic requirements. Now the shed grew to homing 160 locos WAG-7 and 10 WAG-9 locos. And in process of augmenting its capacity to homing 175 locos to meet the future freight traffic envisaged in the 11th five years plan. The Electric Loco Shed/Kazipet is in fore- front for achieving the stringent targets fixed by the Railway Board and Zonal Railways. 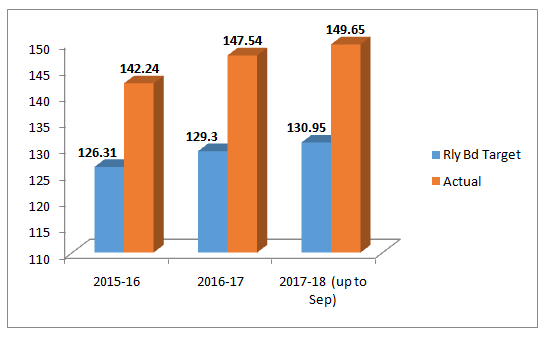 During the financial year 2016-17 has achieved the outage of 147.54 locos against target of 129.30 locos and during current year, so far has given the outage by 14.07% more than the target of 159.65locos. 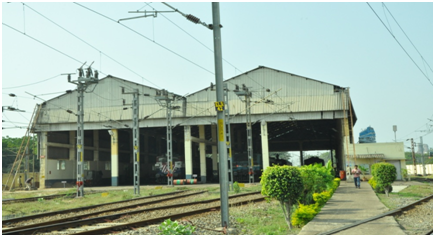 The Electric Loco Shed/kazipet completed the major modifications issued by Research, Development and standards organization (RDSO) – Lucknow, thereby improved the safety and reliability of the Electric Locomotives. 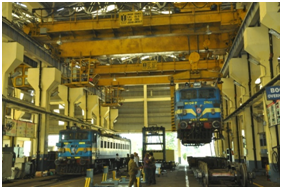 Electric Loco Shed is the Railway infrastructure required to carry out the preventive Electric Loco maintenance by way of light and heavy schedule activities i.e. IA, IB, IC, TOH and IOH overhauls. In addition to preventive maintenance, unscheduled repair and b breakdowns attentions of locomotives are being carried out. To achieve the target the human resources provided is much below the yard sticks i.e. 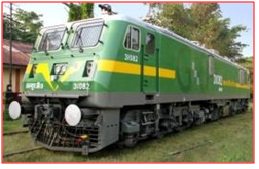 2.59 men per loco as against yard stick of 5.5 men per loco and the human resources are trained for carrying out the high skilled jobs related to the electrical rolling stock maintenance. 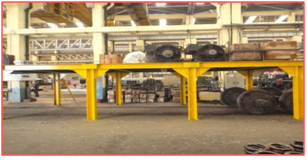 The Loco Shed is one of the sheds which has outsourced all non core activities like electrical maintenance, housekeeping, cleaning, gardening, securities, loco painting and some of core activities to the RDSO approved outsources. Our Human resources technical know - how has helped us to detect the defects during the maintenance activities and resulting it in avoiding of several online failures. 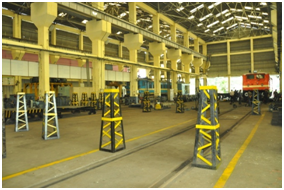 The Electric Loco Shed is adapting the latest technologies for testing of locomotive equipments and as well as induction of latest upgraded equipments and the retro fitment on locomotives for reliability and safety in operations. For better reliability and of operations to avoid online failures, the multiple units of WAG-7 provided are being for traffic to haul higher freight loads. Loco Shed is having chemical and metallurgical laboratory to carry out the ultrasonic testing, Dissolved Gas Analysis, die penetrate testing to detect surface and sub surface crack of loco components for improved safety in loco operations. Pit wheel lathe for wheel turning of locomotives. 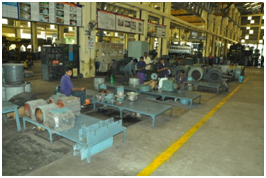 Electric Loco Shed/Kazipet inventory of 554 stock items with AAC values of 11.36 crores is being managed by the Assistant Material Manager to ensure the material resources just in time at economical costs. In Indian Railways on Electric Locomotive wireless multiple unit system (WMCUS) is provided for 12 Locos i.e., 6 Loco sets commissioned as specified by RDSO is in progress in this shed as a first of its kind on Indian Railways. They are under observation. Minor schedules viz. IA, IB, IC1, IC2, and IC-0. Major schedules viz. TOH & IOH. TRIP schedules & yard attentions of foreign locos. TRIP Inspection of BZA & LGD based coaching locos. I.T inspection of LGD based WAG-9 Locos. Minor schedules of 10Nos WAG-9 Locos. Un schedule repairs of all locos. Night stabling Inspection of two MEMU rakes as OEM. Achieved the zonal best and shield(sharing with BZA). Achieved first prize in railway workshop sector, National energy conservation awards for energy conservation. Failure analysis meeting and Job card analysis is being carried out duly involving Head quarters supervisors to audit the performance of all sections. All seasonal precautions are being followed. Section wise reliability action plan prepared based on failures and being implemented. 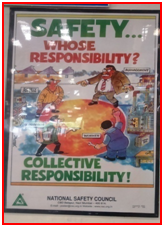 All safety items working condition is being monitored and no loco is allowed with isolation of safety items. 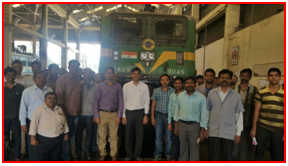 Own your loco concept is implemented ,each supervisor is owning 4 locos for monitoring quality assurance check in minor schedules as per prescribed proforma and accompanying of loco up to 100KM to check all critical items after first trip of major schedule. To improve the appearance and durability of painting of locomotive, use of Polyurethane (PU) painting has been recommended. ELS/KZJ has taken the initiative and has planned PU painting of WAG 7 locomotives during major schedules through outside agency. Out of 160 locos 54 locos are with PU painting including newly arrived locos form CLW. Shed has developed a test bench for M/s. Stesalit make MPCS. With the help of this test bench healthiness of all sub equipments of MPCS such as Input card, Output card, CPU card, Analog input card, Power supply card, filter card, SCU, ISCU etc can be checked. Shed has developed a test bench for M/s. AAL make SIV. With the help of this test bench healthiness of all sub equipments of SIV such as inverter GDU cards, voltage sensor, power supply card etc can be checked. Mapping of GDU cards in each schedule has significantly reduced locomotive failures on this account. 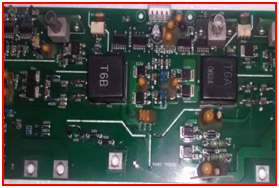 c) In house repair of Gate Drive Unit (GDU) cards of Auto meter Alliance Limited (AAL) make Static inverter (SIV): Pulse transformer failure is a type defect in GDU card of AAL make SIV. Shed could able to repair 23 cards duly rewinding Pulse transformer. In all 51 M/s AAL make SIV provided locos failure prone Ziehl Abegg blower motors replaced with conventional 3 Phase blower motor and achieved improved reliability. Subsequently RDSO issued MS No.0449-Rev.0, Dated: 30.03.2016 for implementing all over Indian railways. Cost of new blower: 8,000. At ELS/KZJ till now 3 cases of track failures observed in M/s Medha make MPCS motherboard. On detailed investigation it was found that fevibond on the track is destroying the insulation and copper track. To avoid this type of failures one cycle check has been initiated during IC2/TOH/IOH schedules. All 60 locos completed. To improve cooling for electronic cards of M/s. Stesalit make MPCS, 02 Nos. of 230V AC cooling fans incorporated in back cover of MPCS. This modification completed in all 24 locos. This has effectively reduced the temperature of Output cards by about 8 ºC to 10ºC. 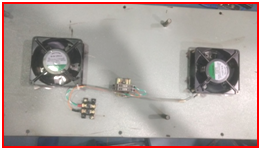 In Siemens make SIV DC fans are being replaced with AC churning fan whenever fails. Till now in 3 locos provided. For replacing of failure prone 2mm bus bar by 3mm firm offered one set per 33,000 but this modification was done with the bus bars using in loco. All 13 locos are modified with 3mm bus bar. Loco No 28010 on 09.09.15 failed due to flasher lamp unit (on roof) fuse blown out. Driver could not check/replace the fuse as it is not accessible on line. Hence a modification is proposed to shift the location of glass fuse from roof top to FL control unit so that driver can check the condition of fuse instead of failing the loco. Progress of modification: All locos completed. Shed has developed an in-house mobile SPM testing unit to calibrate the SPM in position and to check healthiness of PG and related circuit without removing the unit from loco. 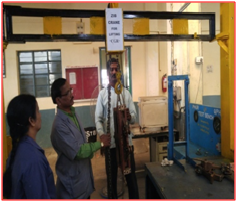 During CGR overhauling, CGR of 30 kg weight has to be shifted to test bench to measure the spring tension of CGR. For shifting, 2 man power is required and it is also unsafe for staff. To ease out the shifting of CGR one tackle has been fabricated and kept between CGR stand & test bench. With this tackle one person can shift the CGR effortlessly. 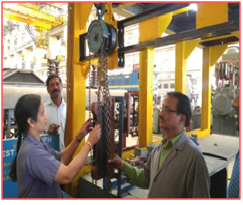 For on load testing of Servo motor graduator (SMGR), SMGR of weight 112 kgs has to be fixed to Graduator (GR) which requires four persons and it is also unsafe for the staff. In this respect one jig with movable arrangement through Wheels has been made. With this arrangement SMGR can be fixed with GR easily by one person and then tested on load which ensures healthiness of mechanical gears and correct assessment of progression/regression times. At HL bay for storage of filtered GR oil separate tank was not available. Due to this only one loco GR oil filtration can be done at a time. If more than one loco needed GR oil filtration locos has to be kept idle for 3 hours and loco has to be shunted to inspection bay for oil filtration. To avoid the detention of the locos a separate tank of capacity 800ltrs has been made in-house and kept at HL bay. With this storage tank 800ltrs filtered oil can be kept reserve for use of 10 locos. Previously Teflon band used to clean with cloth, which is soaked in Orion, manually. By this, Teflon band cleaning was improper in in-accessible areas due to hindrance of brush holder. Accumulation of dust on Teflon band causes V-cone burnt. For proper cleaning of Teflon band a Jig has been made by fixing the Orion soaked woolen felt in the Jig. This jig is fixed to the negative shunt of Traction motor rigidly and then the rocker ring will be rotated in right round. By this Jig inaccessible areas of Teflon band can be cleaned effectively. During IC schedules Teflon band is being cleaned with this jig. Test bench for testing of various components of M/s Medha make MPCS has been inaugurated by DRM/SC on 12.04.2017. By this test bench healthiness of Input cards, Output cards, power supply cards, CPU cards, ISCU cards and Interface cards can be tested. A vertical stacking stand for auxiliary motors has been made with drawer facility. Auxiliary motors can be placed or lifted using the crane easily. 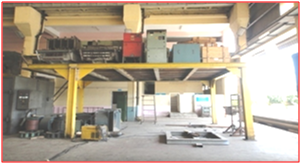 By this, working space has been freed, under the cranage area for over hauling activities of Auxiliary machines. During 2016-17, 8 ZCT failures were occurred. To avoid the failures the following modifications are being done. 1. During major schedule out put ZCT is shifted from AC inductor to near output connection (06 locos completed). 2. During minor schedules proper bunching of I/C and O/G cables of ZCT is being done to avoid stressing of power cable on core of ZCT. One of the main reasons for the bearing failures is excess grease. Some times manual greasing of bearings may lead to excess grease in the bearings. To avoid manual interference an automated greasing arrangement has been made. With this arrangement fixed number of strokes can be pre- set by using counter. This arrangement can be used for pumping fixed quantity of grease required in bearings. This jig is useful when ever loco requires changing of centre pivot rubber bonded sleeve in position, due to bond failure of rubber bush or bottom stopper plate crack. By using this jig we can remove housing along with sleeve, attend necessary replacement and refit the same. With this arrangement time taken to replace the centre pivot rubber sleeve is reduced by 12 hours as there are no Traction motor (TM) connections /disconnections and body lifting. Several cases of TFP oil rising cases were noticed. Upon investigation noticed clogging of radiator. Previously jet water was used to clean radiator. Hence, to ensure proper cleaning of radiator in shed has prepared an in house Radiator cleaning tank for cleaning of transformer radiators thoroughly with cleaning agent during IOH/TOH. 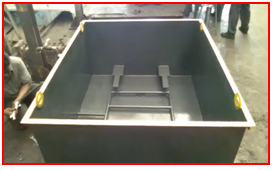 All WAG7 type locos are provided with Ejector nozzle type sand boxes. In order to ensure free flow of sand, sand ejection system is modified as per DSL locomotives. 22 locos are provided with modified sand box. For 4 Sets material available. Being provided during major schedules and planned to do in minor schedules within 2 months. 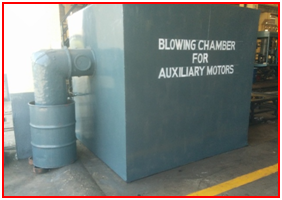 As per environmental friendly measure, in E3 aux section blowing chamber was fabricated to extract the dust during the blowing of stator and other motor parts. 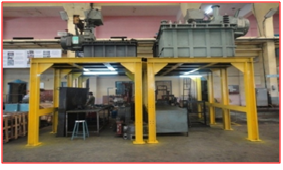 A Tailor made screw lift with required profile and size have been prepared for removing and provision of air drier during major schedule/special attention quickly. 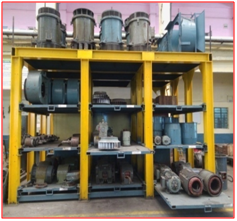 Shed have prepared stacking arrangement with released OHE masts for Transformer, TM, DBR and Auxiliary motors for better utilization of shop floor area. 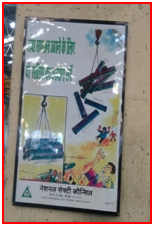 58nos of standard safety posters of English & Hindi collected from National safety council and got them laminated on MDF boards and displayed at various locations of shed for creating awareness among staff for their safety and equipment safety. As per HQ Lr.No.E.221/MS/Vol.XIV,Date:15.12.16 IT schedules of ELS/LGD based WAG-9 locomotives is being carried out from 15.12.16, Till now 19 locos IT schedule carried out. Received First prize of National Energy conservation awards 2016 for conservation of Energy in Railway workshop sector from Ministry of Power, Govt. of India. 1. All inspection bay lights are replaced with LED lights. 2. Shed roof have been put up with transparent sheet for harnessing natural light. No light is being used during day time. 3. 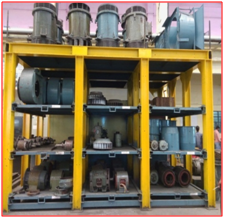 All cranes (05) are provided with VVVF drive for each motor. 4. Energy savers have been provided for 10 Nos welding machines. 5. 10KW solar panel has been provided for pumping station of ELS/KZJ. 6. Air compressors of various sections has been adjusted for cut-in and cut-off pressure settings 6.5Kg/cm2 to 7.5Kg/cm2 respectively. 7. All street lights replaced with LED lights. 8. T8 and T12 tube lights are replaced with T5 tube lights in sections. Above measures have resulted into reduction of Energy consumption by 28000 units and saved about 3 Lakhs. • Laboratory facilities for testing. * Metallurgical analysis of materials. * Magnetic particle test (MPT) - Equaliser / compensating beams, links, TM stator, Auxiliary motor impellers, Bogie weld joints, CBC screw coupling, Knuckle, Center pivot/supporting plate. 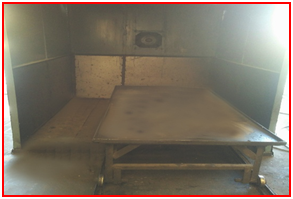 * Dye Penetrate Test (DPT) - Side buffers, TM pinion, MSU, Pantograph, GR rollers, SMGR crank shaft. * DGA analysis of TFP oil by using Gas Chromatography. * Water content in Transformer oil by Carl fish titration method. * Acidity test in TFP oil. * Ultrasonic Testing (UT)- Axles, Armature shaft, Equaliser/Compensating beams, Links, Axle box inner racer bonding. * Metal content analysis with Debris’s monitor to detect metal content in grease of axle box, MSU and Traction motor bearings. Wireless MU coupler (LocoTrol) first of its kind in Indian Railways has been fitted In 12 WAG-7 locos (i.e. 12 MMu’s) are successfully working between KTPS and Rudrampur siding in BDCR sector. Detention on account of detaching, reversing and attaching of locomotives (MU), creation of pressure and continuity test, etc. are eliminated at loading & Un-loading points.MU operation is achieved without cable connection, thus giving flexibility in operation. Coupler forces are minimized to reduce the chances of train parting. 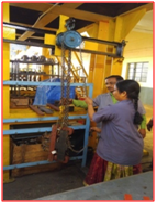 Sri K.L.Pandey, AGM/SC Rly, Sri S.K.Mishra, DRM/SC and Sri B.Singaiah, ADRM/O/SC visited this shed on 19-09-2013 and inspected the working of various equipments and performance was reviewed. In-house developed High Current Injection test and high run test panel was inaugurated by AGM/SCR. Valedictory function of Raj Bhasha Fortnight of C Division organised by Sr.RBA/SC was conducted in Conference Hall of ELS/KZJ. The chief guest Sri K.L.Pandey, AGM/SCR and Guest of Honour Sri S.K.Mishra, DRM/SC distributed Hindi fortnight awards to staff based at kazipet. Shed has given outage of 129.58 % against the board’s target of 114.31 % i.e. 13.35 % higher than the board’s target. Ensuring 100% working of VCD & Air Dryer in all locos Dispatched from ELS/KZJ. No loco is dispatching for service with Negative bonding. Ensuring 04 Nos. of wooden wedges as per RDSO approved design. Ensuring Hand brake in working order in all maintenance schedules. Ensuring availability of fire extinguisher of 05 kgs. 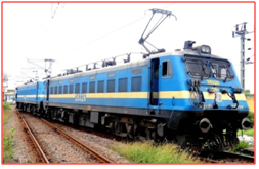 Capacity DCP type is being used in each locomotive with two Nos. in each cab i.e. four Nos. in each locomotive. Ensuring availability of all 08 sanders in working order in all the locomotives, No loco is dispatching for service with defective sander. Ensuring working of PHGR in all maintenance schedules. 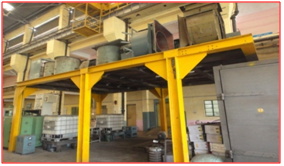 Ensuring condition of Silica Gel in GR & TFP in all maintenance schedules. Train collision avoidance system (TCAS) provided in locos 27406 & 27613 and trials were conducted. Shed has actively associated in this. Shed has procured Hydraulic Torque Wrench for tightening axle cap bolts to reduce man-hours and starin to the staff. Modified pins were provided in locomotives during this month as per RDSO/SMI no 264.Cumulative population - 142 . 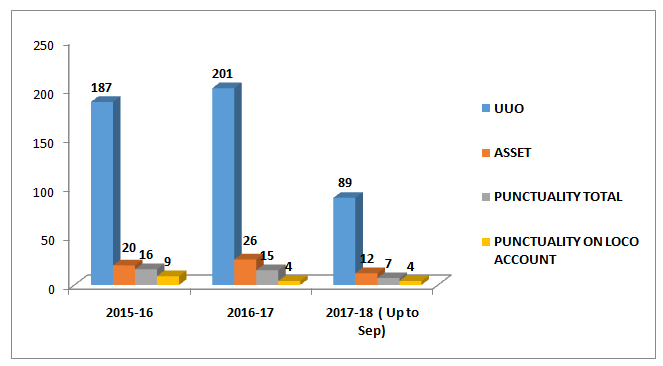 Modified keeper pins as per RDSO modification no 388 were provided in 06 AOH/IOH locomotives during this month by this cumulative of 134 locomotives completed. 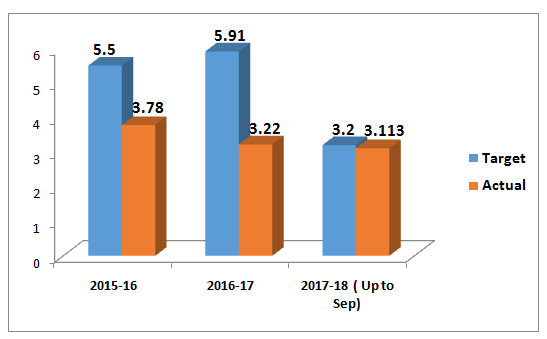 Statistical ineffective 5.66 % during this month as against target of 4%.